A malocclusion is a dental term for a bite problem. Everyone has some degree of malocclusion. However, significant malocclusions can contribute to mouth breathing and interfere with speaking and eating. A poor bite can cause teeth and enamel to wear prematurely. Additionally, malocclusions can affect the overall appearance of your face. Malocclusions are the most frequent reason for braces or orthodontic treatment. Ideally, your top and bottom set of teeth should fit together and form an accurate bite. Your top teeth should fit slightly over your bottom teeth. All of your teeth should line up. Your teeth should be straight and equally spaced. Most malocclusions are inherited. Such conditions include differences in jaw size, poorly aligned jaws, crowded teeth, extra teeth, and missing teeth. Accidents, tumors, or prolonged thumb sucking can also cause malocclusions. There are many types of malocclusions. The most common malocclusion is caused by overcrowded teeth. This occurs when the teeth do not have enough room on the jaw and move out of alignment. Additionally, unevenly spaced teeth, protruding teeth, or missing teeth can pose problems. Bite problems occur when the top and lower jaws do not line up correctly. An overbite describes when the top front teeth and jaw overlap the bottom front teeth and jaw. The lower teeth may bite into the roof of the mouth. An underbite results when the front lower teeth and jaw overlap the front upper teeth and jaw. A crossbite is a malocclusion in which the upper teeth rest inside of the lower teeth. A cross bite can affect the way the jaw grows. When the upper and lower teeth do not meet or overlap, an open bite occurs. Prolonged thumb sucking can contribute to open bites. A midline shift occurs when the dental midline at the center of the top and bottom teeth does not match. This can result if the back teeth do not fit together. Your dentist can diagnose malocclusions by examining your teeth and bite patterns. Your dentist will observe how your teeth come together when you bite. X-rays may be used to provide more information about your tooth and jaw structures. 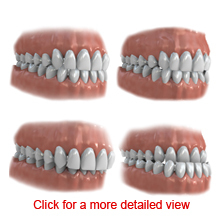 Your dentist may recommend braces and refer you to an orthodontist to correct the malocclusion. An orthodontist can evaluate you for orthodontics by conducting a thorough examination. Tell your orthodontist about the problems you have experienced and your desired outcome. In select cases, dental procedures may be necessary before applying braces. Some people may need to have teeth removed to correct overcrowding. On rare occasions, surgery is recommended to shorten or lengthen a jaw. Your orthodontist will take X-rays of your teeth and head. Your orthodontist may take a panoramic X-ray to detail the full perspective of you teeth, gums, and jaw. X-rays are painless procedures and simply require that you remain motionless while the images are taken.